Learning happens step by step. Basic trainings continue into specific knowledge exchange and certified courses. Continuous learning is best provided by trainings that are built around each other and pass on to new levels smoothly. 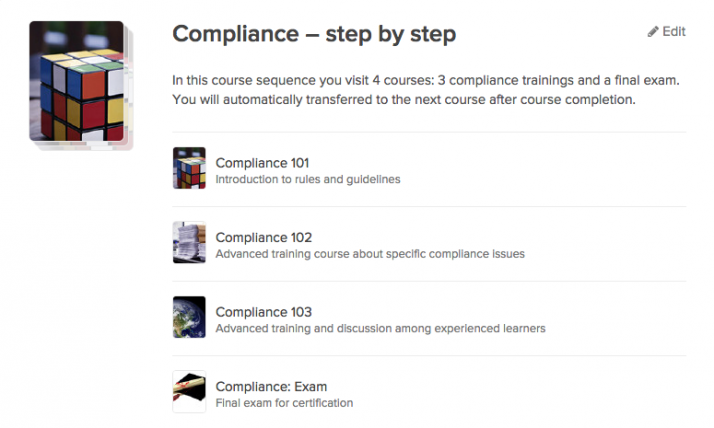 You can now create a learning path for your participants by simply enrolling them into a series of courses. The learning program allows course flow sequencing and bulk assignment of participants. 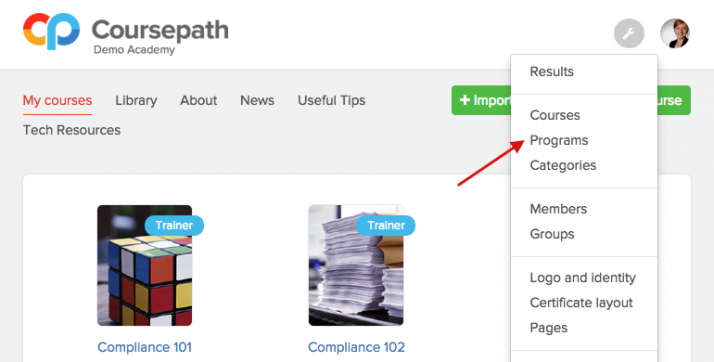 With this automation, your participants follow a clear learning path. Once they have finished and/or passed the prerequisite course(s), they are automatically enrolled to the next, helping trainers save a lot of time and effort in training administration. Courses arranged in a learning program save time and effort in training administration, as participants are automatically enrolled in following courses. The learning program is flexible and can accommodate as many courses added into it. It allows dynamic editing of content, which will not in any way affect the learning program. Easily add and remove courses as needed. This new feature perfectly fits a target audience with a modular ramp-up learning series of courses. Another advantage of the learning program: You get a history of the discussions and exam results, which you can of course moderate, analyse and take into further consideration in the learning progress of your participants. Below you find some examples of scenarios in which a learning program can be adopted. Find out what your employees, customers and partners already know. Use the learning program to launch a pre-assessment course to gauge and determine their level of understanding on a certain subject or their readiness to proceed to the next set of planned (intermediate) courses. This way you are able to customise your trainings accordingly to the needs of your audience. Give trainings and certification on specific subject matters e.g. health and safety, IT, security through a sequenced learning program. Participants only proceed to the next course in the program when they have successfully finished and passed the first. This way, participants stay focused on the subject matter. A great way of offering this kind of training is through bite-sized learning. Handing out the certificates can be fully automated in the system or carried out manually by the trainer or manager. If needed, the test score can also be reflected in the certificate. The learning program is also best used for onboarding new employees. Create a series of obligatory onboarding training courses such as introduction to the company, information about products and services, as well as HR-related topics e.g. employment policy and security. You can also add job-related ad-hoc courses along the way where experienced employees take part as well. This way, new and experienced employees are in contact with each other and share their knowledge together. By automating the learning path you are assured that the participant is assigned to the courses he or she needs to comply and follow. Open Programms in Settings and start dropping and dragging courses into a relevant learning program.